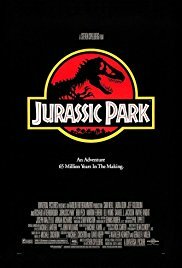 A billionaire has created an island environment with real dinosaurs created from the blood in a mosquito perserved in amber, and prior to its opening day he invites four adults and his two grandchildren to the facility to give it a test run. However, while they are out in the park a traiterous employee shuts off the electric fences to create a diversion while he steals dino-embryoes. The people out in the park must somehow survive, and those left in the administrative centre must try to re-establish the security. But there are dangerous beasts on the loose. Will any of them survive? Once we get the exposition over with, which includes a detailed description of how dangerous velociraptors are, it all kicks off, with almost continuous set pieces putting the characters in close proximity with the dinosaurs. The T. Rex is an almost constant presence, if not in sight, at least somewhere close and as time goes on the velociraptors begin to threaten the survivors, most famously searching for the two children in the facility’s kitchen. People die, but there is nothing else that might offend. A View This film remains pretty watchable today, since it was ground breaking in terms of its representation of the “monsters”. There is lots of action and peril without unduly stressing the viewer (in my view), so still a watch on a rainy Sunday afternoon. I have made it an “Almost Must See”. Additional Info The trivia on IMDb is almost endless, and there is much of interest there for film enthusiasts but maybe the most important info is about the money. The rights to the book were bought for $2 million before publication. It got close to covering its $63 million budget on its first weekend and it finally grossed over $1 billion. Steven Spielberg made £250 million.